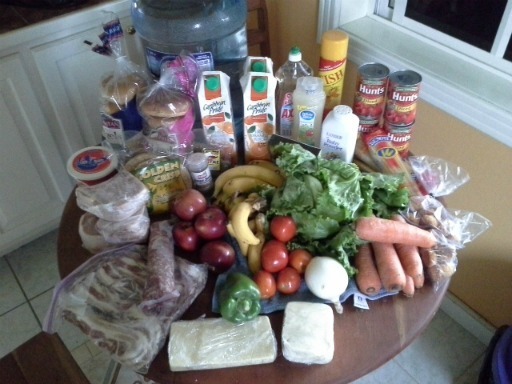 Often when we talk about cost of living in Belize, people ask about what everyday things cost. So today we had a full shopping list which including going to the butcher, the market and the grocery store, so it was a perfect time to capture it all together and share it with you. This type of shopping isn’t an everyday thing for just the two of us, as you will see there are several items for freezing and long lasting things mixed in. 1 5 gallon jug of Crystal water $4. Oh and I was able to grab a picture of the butcher cutting the chops to Dennys request, since he will be the one cooking them, wink wink. Why baby powder, you don’t have any babies in the house? Talc powder is a great ant blocker when sprinkled in the doorways and window sills. Also I sprinkle it on our down mattress cover, in the crevices when one of us complains that we felt kinda itchy at our feet after sleeping, just in case there are little things that we can’t see there. Mosquito coils, I thought you said bug are minimal where you are? Yes it is true, we hardly are bothered by mosquitos on a daily basis but the nights have been chilly and it has been nice to sit outside after dark and work on the computer. I am hoping that having a coils burning will help deter all the little bugs that are attracted to the light of the laptop. Why are you buying boxed OJ when you can juice it fresh yourself? Denny already prepares his daily drinking juice with carrots, apples, ginger, with his favorite Jack La Lanne juicer, so having the convenience of the natural OJ is just nice and its sugar free with no additives and preservatives, made in Belize. What are apple bananas? They are a delicious and even though they are banana they taste like you are eating a fresh apple. Why are you buying canned diced tomatoes when fresh are so abundant? Denny just made homemade spaghetti sauce with fresh tomatoes and it was divine, but he wanted to try it with canned for taste comparison. If we can answer any questions on general grocery shopping feel free to leave a comment below or join in the conversation over on our Facebook page as well. A FREE Gift just for You! A Grown-Up's Guide to Happy Travels. A mini-guide to help you avoid travel 'nightmares' and make travel memories. We love loving in Belize and I invite you to the home page of our site http://www.belizeexpats.com and sign up to get our free mini book that answers some of those questions. As far as gated/non gated, Belize doesn’t have very many gated communities, people mostly live like locals here…..not like in Costa Rica at all, but your individual place should be gated for your peace of mind. I agree Madeline…we will get some of those on the weekend trip to Market. The prices don’t seem all that different than what I pay here in Philadelphia which surprises me—especially for the local produce and meat. Suzanne, lol, you have to cut them in 1/2 for the conversion from Belize dollars to US dollars. 2 Belize dollars are equal to 1 US dollar, thus we only spent $31.50 US at the butcher. What an interesting post and a good tip on using talc powder to keep away ants. I’ll definitely try it. 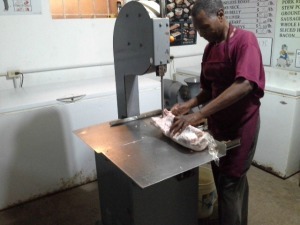 I was also impressed at how tidy the butcher shop is in Belize compared to Mexico and Guatemala where I have to close my eyes due to the gruesome carcasses on display! I’ve always wanted to live in another country, especially south of the border. But right now it is best to live vicariously through people like you! I enjoyed the grocery shopping article. No worries Elizabeth, we lived vicariously through others for years. When your ready you will be well prepared for whenever you end up 😉 .